Getting dinner on the table every night isn't easy; there's planning, prepping and cooking -- not to mention clean-up! But that doesn't mean it has to take up hours of your time each day. 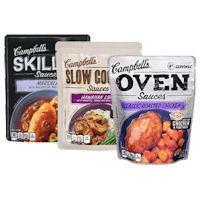 With Campbell's Sauces you can spend less time in the kitchen and more time with your family. A rich tasty soup. Makes a great meal.